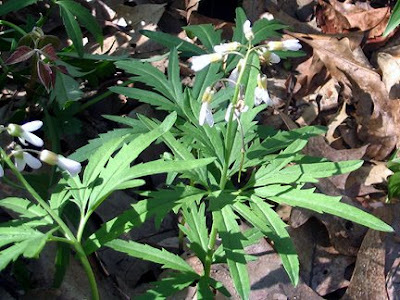 I love woodland wildflowers (spring ephemerals), but as I see them only once a year, I tend to forget which are which. I recognize their forms, sure, but I tend to go blank on their names. This can lead to certain embarrassment and awkward greetings in the field. Compare, for example, the greeting "Hello, um... er... Fred?... Ginger?... Guadalupe?... Er, cute little white-ish pinkish subtly striped flower I distinctly remember seeing at Old Friends in Chelsea on the east side of their house three years ago when stopping by looking at their herb creations!" with "Hey, spring beauty, wassup?! May I call you Clay?" 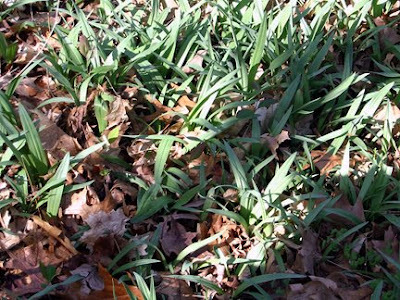 Wild leek (Allium tricoccum), usually found in flood plains/low mushy areas. They bloom with a white flower later in the season. Blood root ( Sanguinaria candensis), so cute with its neat leaf shape and reddish stem. Eventually blooms in delicate white flowers with eight to ten petals. 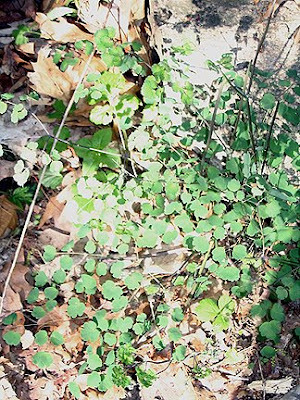 Early meadow rue (Thalictrum dioicum ), is a dioecious plant, meaning there are both male or female plants. Edit: Ooh, a better photo from the same walk is here. Trillium (Trillium grandiflora), fairly recognizable but oh so cute. White blossoms fade to pinkish purple. I like plants whose common and Latin names are the same! 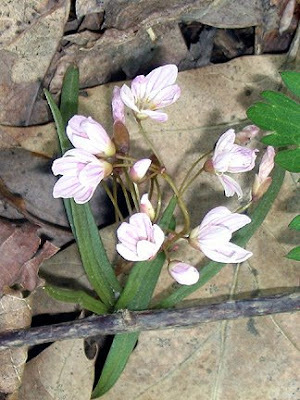 Spring beauty (Claytonia virginiana), with cute white flowers with pink-purple stripes! 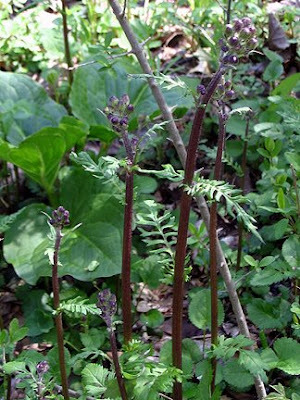 Unlike other spring ephemerals, spring beauties can regrow even after deer grazing! 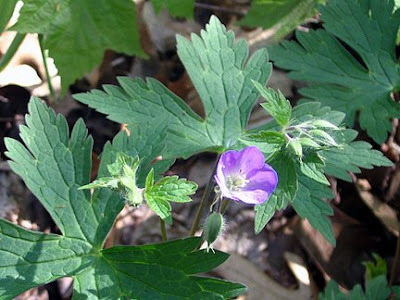 Wild geranium (Geranium maculatum), just starting to bloom. Don’t even talk to me about Pelargoniums! Dutchman’s breeches (Dicentra cacullaria), cute blue-green leaves and an indicator species of a southern mesic forest (rich, well-drained soil). 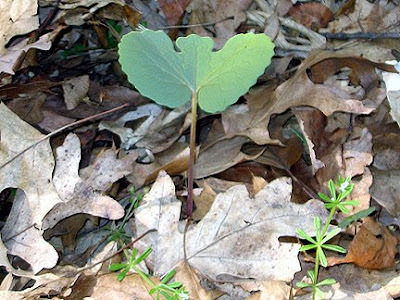 The same species as bleeding heart. Red baneberry (Actaea rubra) or white baneberry (Actaea pachypoda), can't tell until blooms. A cute woody. Red baneberry has taller, thinner stalks with multilple white flowers (racemes), that turn into red berries in fall. White baneberry has shorter, wider racemes with white flowers that turn into white berries in fall. Cool! Berries are poisonous. Click for flower/berry photos. Gooseberry (Ribes cynosbati), will get translucent green berries with subtle stripes in the fall. Cutleaf toothwort (Dentaria lacinata), also an indicator species for mesic forests, has cool toothed leaf margins and sets of three whorled leaves. Has four-petaled white flowers. 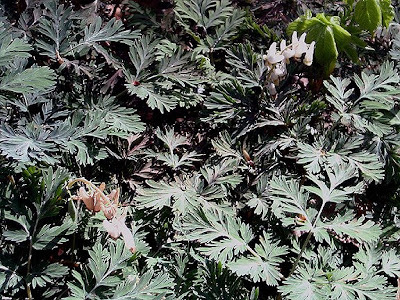 Virginia waterleaf (Hydrophyllum virginianum), spreads by rhizomes. 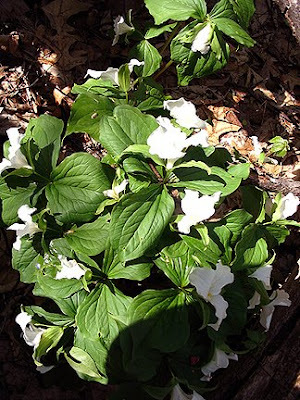 Has blue, white, or purple flowers later in spring, and cool mottled leaves. Dogwood tree (Cornus spp. ), has beautiful white flowers (white blotches in photo!) facing upright. Not only needs some shade, but is an understory tree in protected locations so cannot handle wind. 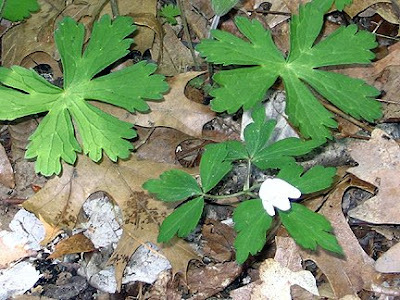 Wood anemone (Anemone quinquefolia), has five-petaled white flowers a bit later (bottom right). I love all anemones, native and cultivars! 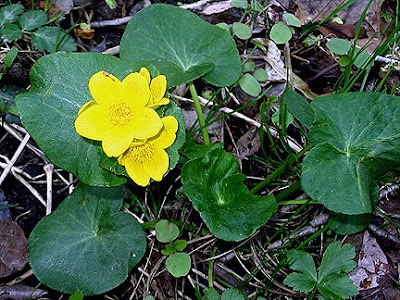 Marsh marigold (Caltha palustris), grows in wet areas, with beautiful yellow flowers and waxy leaves. Golden ragwort (Senecio aureus), so cute. Amazing how those purple buds open into bright yellow flowers! Click for a nice shot of both the purple flower buds and yellow flowers. Yellow trout lily (Erythronium americanum), so, so cute in its drooping flower. And the sun backlights the leaf, showing the spots. 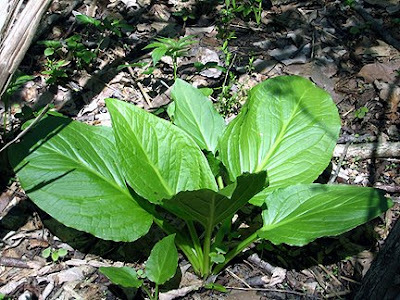 Skunk cabbage (Symplocarpus foetidus), above as I saw it yesterday and below on April 7, 2007, with the spadex showing and the leaves still curled up. It comes out early in spring, melting the ice as the spadex and its eeny beeny flowers bloom inside. It is pollinated by flies, and does apparently stink. Cool, huh?! I also saw may apple (Podophyllum peltatum), false and real Soloman’s seal (Smilacina racemosa and Polygonatum biflorum), bedstraw (Galium spp. 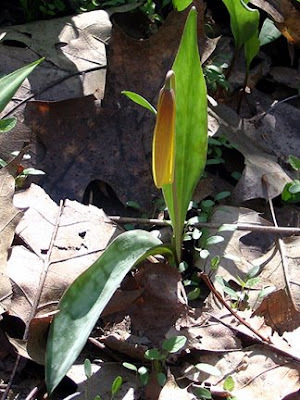 ), and Jack in the pulpit (Arisaema triphyllum),but didn’t photograph them (well, you can see the bedstraw in the second photo with the bloodroot). Notes to self: For future photos, be aware of sun and shadow so one part of the photo isn't washed out/overly saturated. Pore over camera manual to find out if automatic settings can be overriden, especially flash (even though I thought I'd already disabled it!). Thanks for this tutorial on wildflowers. I love wildflowers so this was fun! So gooseberry is a native plant where you live, wonderful! Yolanda, you pose an interesting question! It turns out the species I listed, Ribes uva-crispa, is native to Europe. 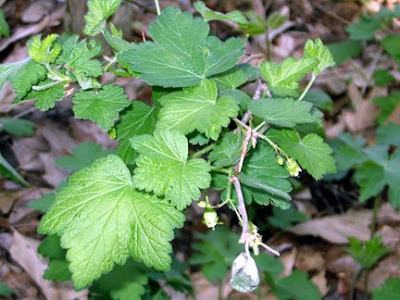 We do have a North American version, native to Michigan, Ribes hirtellum, hairystem gooseberry. I don't actually know which one it is in the photo, but will check with the naturalist. We do have some non-natives in our natural areas, some invasive (buckthorn, garlic mustard, purple loosestrife, autumn olive, honeysuckle--see list for more and Latin names) and some not, as gooseberry would be, if in fact it's the European version. Stay tuned! 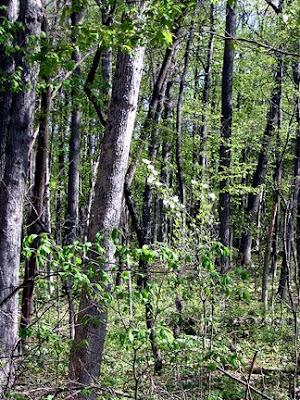 Nice wildflower pictures... do you have garlic mustard invading the woods around there? Don, oh yes we have garlic mustard! The city of Ann Arbor sponsors a lot of invasive removal work days and recently had many for garlic mustard. I pulled some from my office building, too. Those darn tiny seeds are just multiply-rific! Don, see this web page for a garlic mustard pull campaign by a local enviro group. Wonderful tour, do you grow them in your garden, too. I love that we can be hundreds of miles away and still have some of the same Eastern deciduous forest wildflowers. Click on the dot that's in NE Ann Arbor. Cool! Great photos. I'm definitely not up on my wildflowers. I was gardening at a client's house this week. She has trout lilies in her garden. I knew they were 'something,' so I didn't weed them out. Now I know what they are! Wonderful blog, my first visit here, I really liked this post, I have seen lots of these wild flowers in my neck of the woods..Va. but wasn't sure of the names, thanks for such and informative post and great pic's. Yolanda--I just heard back from Catherine Marquardt, the leader of the walk. She says the gooseberry in question is Ribes cynosbati, which is the most common type of gooseberry in southeast Michigan. 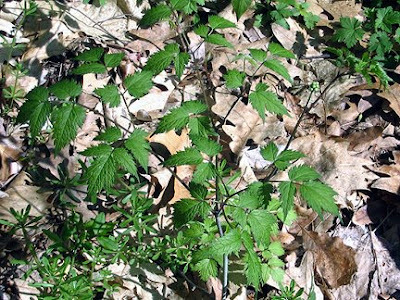 We also have Ribes hirtellum and Ribes americanum, both of which grow in wetter areas. The European ones are a different species. Gail--Thanks for the camera info! I do grow a few spring ephemerals in my garden (trillium, meadow rue, and hepatica) but I tend to have too much sun in spring (which is ironic because the rest of the season I have too much shade!). I do grow a variety of native perennials, integrated into my beds, spring-fall. Cat--Welcome and thanks for stopping by. 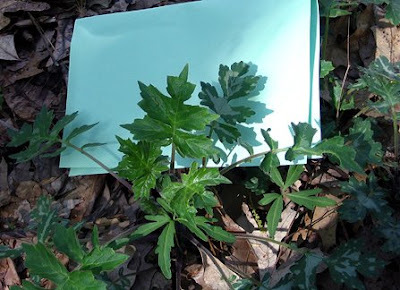 Suzie--Your photo of early meadow rue shows the plant much better than mine, so I've added a link to the original entry. Fabulous wildflower tour. I haven't seen many of these for years (since leaving the east coast) so it was sentimental viewing your photos. Nice tour! Our marsh marigolds are starting to bloom in every wet area by the roadways...all over! My bloodroot is just now starting to bloom, but our spring is really late this year. Almost time to start hunting again. It's just getting warm enough for things to emerge here. So far I've only spotted Patridgeberry and will keep returning until I catch this one in bloom. I don't know - maybe I just use the wildflowers to get out for a walk. It's my quiet time.